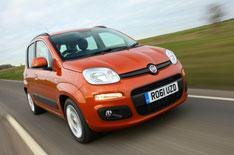 2012 Fiat Panda review | What Car? The 2012 Fiat Panda is a practical five-door city car that's longer and wider than the model it replaces. It has a more rounded body than the previous Panda, and that theme continues through to the cabin, where many of the features also have a more rounded look. Initially, the new Panda will come with three engines and three trims, with prices from 8900 for a 1.2 Pop. Youll need to stretch to Easy to get remote central locking and air-conditioning, and the range tops off with the diesel-engined 1.3 Multijet Lounge at 12,250. This brings the promise of more than 70mpg, as well as alloys, electrically adjustable door mirrors and front foglights. Whats it like to drive? On the road, theres an endearing and enjoyable quality to the way the Panda drives: its easy to manoeuvre in town, mostly smooth-riding and with a mature feel on the open road. Other than wind noise from around the side windows, the Panda copes well with motorway journeys, while it grips surely and displays balanced handling along the most twisty country roads. Even the basic 1.2-litre engine gives decent performance around town and will happily cruise at 70mph. Compared with the larger engines, its relatively limited torque is only obvious at higher speeds, where you often need to drop down a gear to cope with the ebb and flow of traffic. In this respect, the Twinair petrol engine and the 1.3 Multijet diesel are less demanding, and theres no denying that their performance is stronger all round. However, given how much extra they cost, and that most Pandas will lead a predominantly urban life, the 1.2 makes more sense. That conclusion is reinforced by the fact that the 1.2 is also the most refined of the three engines. The Twinair unit is particularly noisy in its native environment of stop-start urban traffic, while the Multijet unit is quite noisy when revved. Whats it like inside? The Pandas cabin features dials, stereo and ventilation controls that have a more rounded modern look than the previous car's. Theres a two-tone colour scheme to the upholstery, although it has to be said that some combinations are rather garish. Similarly, the materials arent the last word in quality there are no soft-touch luxuries in here, just hard-wearing plastics but they are nice and colourful, especially on the upper two trims (Easy and Lounge). Up front, head- and legroom are decent, and although the cabin is no bigger than in the old car, Fiat says theres more room because the front seat backs are thinner. As long as those front seats arent slid too far back, a couple of adults will fit in the back; and, while taking four six-footers is a squeeze, the Panda is very practical for a city car. Its boot is a decent size, while also nicely shaped and with a wide opening that makes it easy to use. Should I buy one? The Panda is a thoroughly endearing small car, so it should certainly be on the shortlist of anyone considering a city car. Were not especially taken with versions that use the Multijet or Twinair engines especially given their price but the 1.2 Easy (with remote central locking, air-conditioning and a smarter interior than on Pop cars) looks a fine way to get change from 10,000.